I’m speaking at this weekend’s RavenCon in Williamsburg. If you’re going, here’s my schedule for when and where you can find me. Room 8 – Building a consistent world is a complex process, whether for a novel or a game, and as important to the story as plot or character. How deep does the world building need to go to imply that there is a fully realized world beyond the story? What can be implied, what must be told, and what does the creator need to know? Room E – When do you know it’s time for a major rewrite of your novel? What do you do when an editor asks for a severe change in word count, to delete or add a subplot, or change the viewpoint character? Is it best to cut with precision, or chuck it all and start over? Dealer’s Room – Need some Gidion Keep in your life? I’ll be signing (and selling) copies of my book at this time. Of course, I’ll have my books with me all weekend, so if you miss me here, just catch me after any of my panels. Room F – What works and what doesn’t when striving to create a memorable and believable teen character? Our authors talk about deciding when to kill off characters, writing the death scene, and dealing with audience reaction. Room G – While Marvel dominates in movie theaters, DC has been quietly building a strong presence on television. Is this their best bet? Which hero should be the next to get a show? Room F – The teenage years mark the transition from dependent child to independent adult. Those years are often associated with some form of rebellion, either against authority or against parents, as teens learn how to test limits and act on their own. How important is it to express feelings of rebellion in a YA novel? Does it add authenticity, perform necessary stage-setting, or is it a distraction? Room E – Is there a difference in designing nonhuman species for fantasy compared to SF novels? I’ll also be taking my grumpy dragon Windsor with me and taking pictures of him with some of the cosplayers. You can see the pictures on my social media all weekend. 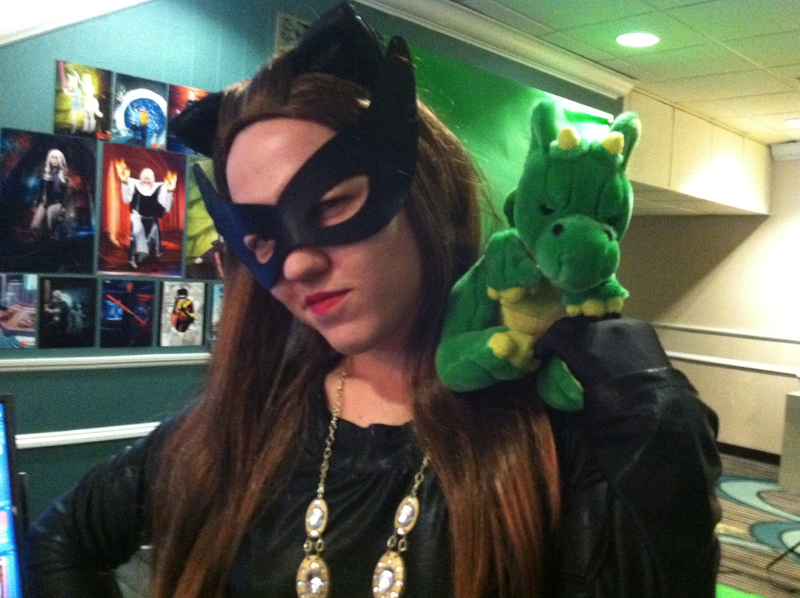 In fact, I plan to give Windsor a bit of a cosplayer scavenger hunt. I’ll share some of that list with you in my blog tomorrow. Have some suggestions for what should be on his list? Share your suggestion in the comments or tweet it to me. This entry was posted in Gidion Keep series, Out in the World, Speaking Event, Writing and tagged Am Writing, AmWriting, book signing, cosplay, cosplayer, cosplayers, DC, DC Comics, edit, editing, fantasy, fantasy vs. sci-fi, fiction, Flash, Gidion Keep, Gidion's Blood, Gidion's Hunt, GidionKeep, Green Arrow, kill your darlings, killing your darlings, protagonist, RavenCon, rewrite, rewriting, science fiction, speaker, strong protagonist, Supergirl, teen rebellion, teenage rebellion, urban fantasy, vampire, vampire hunter, vampires, Williamsburg, world building, worldbuilding, YA lit, young adult, Young Adult books, young adult fiction, Young Adult Literature, young adult series. Bookmark the permalink.